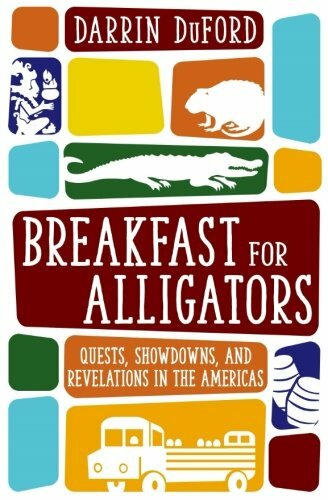 In “Breakfast for Alligators: Quests, Showdowns, and Revelations in the Americas,” award winning author, Darrin DuFord shares his excursions across fourteen different countries throughout the Americas. Full of adventures, exotic cultures, cuisines, and local customs, readers will be easily enamored with DuFord’s engaging storytelling. He writes with marked flair and I found his straightforward approach refreshing, clever, and thoroughly entertaining. I could easily immerse myself in the local landscapes visited from the detailed descriptions of the surroundings, and enjoyed the way he connected with the “locals” during his travels, as though he’s never met a stranger. Several of the stories in “Breakfast for Alligators” appear in other publications, but as I just recently found DuFord’s work, they were all new and exciting to me. And, while I’m certain the stories more than adequately hold their own as standalone narratives, the arrangement in which the stories appear in this book are such that it’s more like following along with the author as he treks through his travel itinerary, and I took great pleasure in the experience. I was completely content in my role as an arm-chair traveler. I do not have the daring or spirit to venture too far from home. While I do find trying new things, going to new places and experimenting with new cuisines appealing, the most glamorous trips I ever take are vicariously through the volumes of great works by experienced travelers. Most inviting to me were the delicacies offered up throughout DuFord’s travels. Most were fascinating to say the least, like cassareep, a sauce made from boiling down toxic raw cassava juice, used in many dishes in Guyana. The grilled guirilas – corn tortillas wrapped in banana leaves and stuffed with fresh cheese (guajada) from Matagalpa sounded warm and comforting. I was enticed by DuFord’s description of “grabbing chunks of rich, on-the-bone meat, from a helping of labba” (27), until further reading described it as being a cat-sized rodent! And this is just a handful of the flavors from his travels! For an extraordinary adventure and an engaging read, I highly recommend “Breakfast for Alligators” by Darrin DuFord.